Learn about the different parts of plants, including which parts are edible! For many people, a fruit or a vegetable is a food item we buy from the store or the farmer’s market and use to make a meal. For farmers and gardeners, fruits and vegetables are complex plants with different parts that perform a variety of functions. In some cases, only the fruit of a plant can be eaten, but many plants have edible roots, seeds, and leaves that allow us to make the most out of every piece of produce. Do you know all of the different parts of a plant and which parts can be eaten? 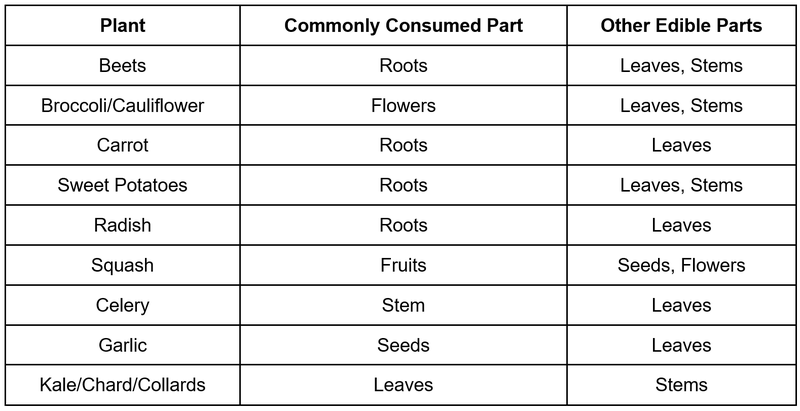 While there is great diversity in the structure and characteristics of species of plants, most of the plants we know and consume are made up of six basic parts: seeds, roots, stems, leaves, flowers, and fruits. 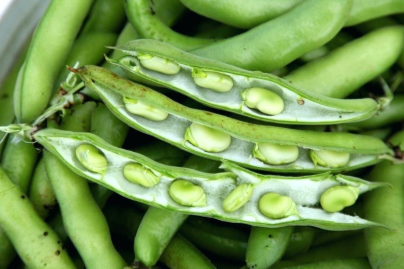 First, seeds are what most plants create in order to reproduce. Seeds contain energy and genetic material inside a protective cover that sprouts in the proper conditions. Sometimes seeds can be spread and planted by animals, humans, and even the wind. 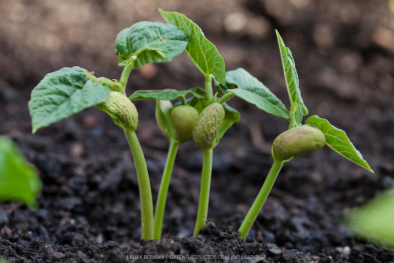 When the seed sprouts, roots spread downward into the soil to help anchor the plant into the ground, take up water, and collect nutrients for the plant to grow. Meanwhile the plant begins to grow upward via the stem and leaves. The stem of a plant has two main jobs: to support the upper parts of the plant and to transport water and nutrients throughout the entire organism. Stems can be short and thin or tall and thick, soft and flexible or strong and rigid. (Think of the big difference between a dandelion stem, a broccoli stalk, and a tree trunk!) Growing out of the stem are leaves. Leaves are the parts of a plant that make energy for it to survive and grow. Through photosynthesis plants capture sunlight and carbon dioxide and produce energy for the plant while emitting oxygen into the atmosphere. 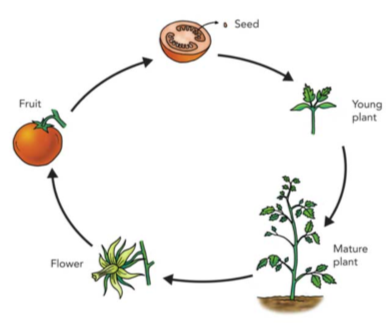 Once a plant has established itself, environmental conditions trigger it to begin the reproduction cycle. It grows flowers, which are beautifully complex parts of plants that produce seeds for more plants to grow. They are often colorful and exciting, which allows them to achieve proper pollination. Pollinators (like bees, butterflies, and hummingbirds) spread pollen from flower to flower, enabling the plant to grow. Eventually the flowers will develop into fruits. Fruits, as a part of the plant, take the form of peppers, tomatoes, cucumbers, apples, and more. Fruits surround and protect the seeds that the flowers create. Just like flowers, fruits are often tasty and colorful in order to attract animals, who eat the fruit and spread the seeds. “So what is the difference between a fruit and a vegetable?” is a question that farmers are often asked. Fruits, as a botanical classification, come from the flowers of a plant, whereas vegetables, a culinary classification, describe all of the other parts of the plant that we can eat. Sometimes we confuse the two and commonly consider fruits to be sweet (like apples and strawberries) and vegetables to be savory (like tomatoes and peppers). Only the leaves, roots, and stems of a plant are culinary classified as the vegetable. Technically, if the seeds are on the inside of something you eat, it is a fruit! Although we often eat only one part of each fruit and vegetable plant, there are many ways to use the other parts of plants and prevent food waste. Food waste happens when food is thrown away or never eaten. Food is wasted at the supermarket, in restaurants, and at home. Between 30% and 40% of all the food grown in the United States is thrown away annually! 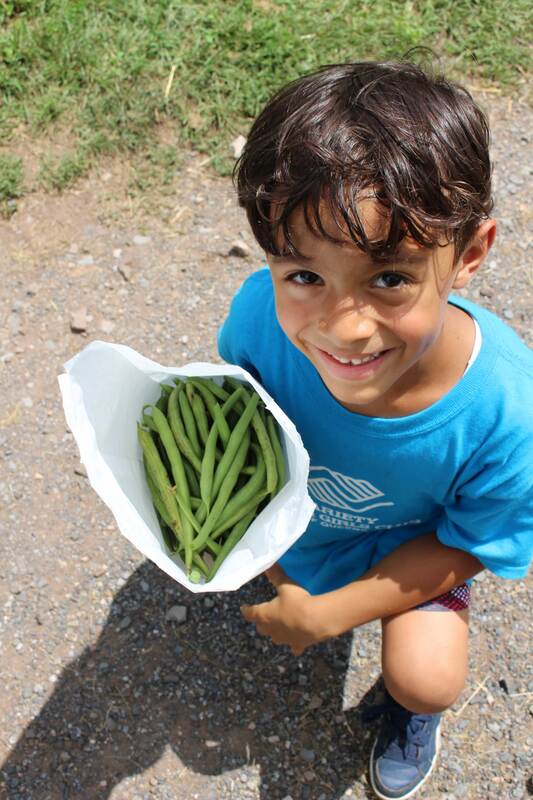 In our 2019 education season, our Healthy Eating Lesson theme is about the parts of the plant that we can eat. We are excited to explore more about the parts of plants with our students and readers in the upcoming months.